Apitherapy is an old Chinese medicine that uses honey bee products (like honey, propolis, royal jelly, pollen, bee stings, etc.) to treat/heal many different health isssues. Give yourself a change to heal and contact us for more information or to book an appointment. In this picture you can see one treatment on the back with bee venom (micro apipuncture). Bee venom therapy is very effective for treating many problems from simple joint pain to neurological diseases like multiple sclerosis or even cancer. Bee venom has powerful anti-inflammatory effects, removing very easily pain produced by inflammation, for example sciatic pain, back pain or joint pain. Bee venom therapy is also very effective to remove scars. "Micro stings" are used to supply micro doses of bee venom. This is a Japanese method and much less painfull for the patient. 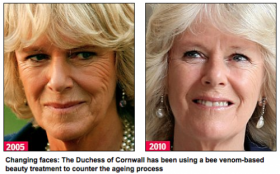 Bee venom therapy is also used in cosmetics to remove face wrinkles.